Home » Real Estate » How to file complaint under RERA Online? After the launch of RERA (Real Estate Regulatory Act), home buyers are hopeful that new law will protect them against bullying of the builder. However, million dollar question is how to file a complaint under RERA? What information is required? What action can one expect? In this post, we will take a look at detail process of logging compliant under RERA. If you are not aware of RERA you can go through detail explanation of RERA from here. RERA complaint should be in the prescribed format. As RERA authority is different in every state a procedure and portal for filing complaint are different for every state. The RERA Complaint can be filed only under the violation of rules and regulation established under RERA act. You need the following information in order to file a complaint under RERA. RERA is central law. However, the method of implementation and versions are different in every state. After notification of RERA, some states like Gujarat, Maharashtra, and Karnataka have launched an online portal to help Real estate builders, property buyers, and agents. The method for filing a complaint against builder or promoter under RERA act online is given below. I have covered a method for Gujarat and Maharashtra state. In most of the state method of filing, a complaint is same. # Step 1 – In order to register RERA complaint in the Gujarat State, you need to go to Gujarat RERA portal. On the home page, you will find a link for Complaint Registration. 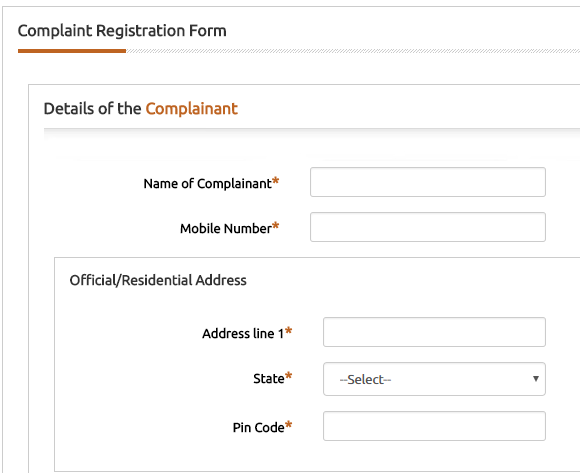 # Step 2 – Once you click on the Complaint Registration link, you will be redirected to the page where you need to provide details of the complaint. # Step 3 – You need to input your name, address, contact details and details of the complaint. You have an option to attach supporting document. # Step 4 – You need to pay Rs.1000 for the registration of complaint. You can use net banking facility for the payment. # Step 5 – Provide acceptance on the declaration and submit the complaint by pressing the submit button. The time taken to act on complaint varies based on nature of complaint. # Step 1 – In order to register RERA complaint in the Maharashtra State, you need to go to Maharashtra RERA Portal. Click on Online Application Menu. # Step 2 – You will be prompted with Login and Password. Click on New Registration. Select user type as Complainant as shown in the image below. Select Appropriate User Name and Password. Once you are done click on Create user. 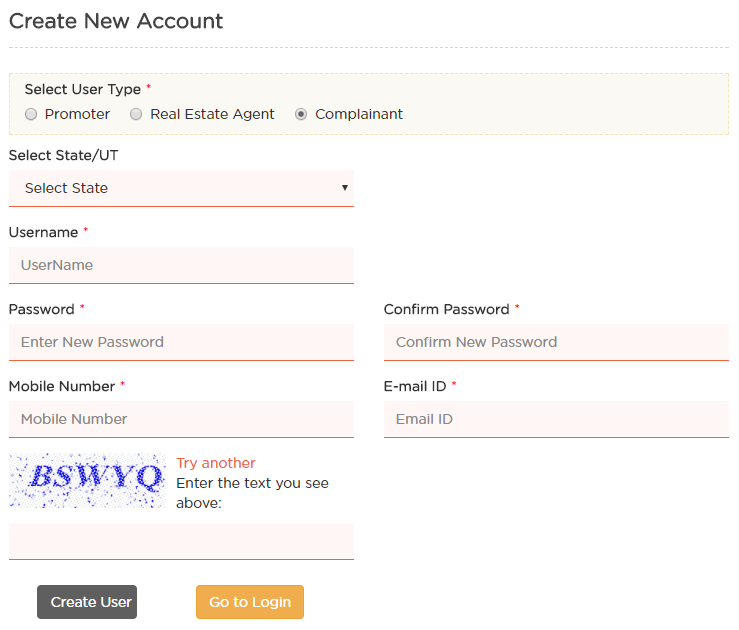 # Step 3 – Once your id is created you can log in with provided credentials to RERA portal. Upon registration, you need to provide personal information including your residence detail. # Step 4 – On left side navigation pane, you will find an option to Add New Complaints as shown in the image below. # Step 5 – After registration you need to make payment of Rs.5000 by going to payment link. Once the complaint is registered both parties builder and a home buyer will be called to express facts and figures. After listening to both parties RERA will give a verdict. If you are not satisfied with RERA verdict you can file a case in high court. I hope method given here for the raising online complaint under RERA will help home buyers and builder both. Do share your queries and views in the comment section. I have done 90% payment to builder in Vasai in june 2016. Builder had promised to give possession by October 2016. However builder had not mentioned the date of possesion in agreement of sale. The builder registered in RERA couple of months before and have mentioned possesion date as december 2018. Can i file complaint with RERA and demand interest since the period 90% payment done? As builder is registered in RERA you can file complaint. However, you should have all evidence against builder to make proper case. But what about date of possession? RERA will consider which date? The builder had done the work of each slab after interval of 2 and half months and had taken 90 % payment in terms of 10 % everytime after 2 and half months. So Can I claim that the builder should provide me possesion after 2 and half months from the day I paid 90 % payment. If it is stage wise payment and builder kept his promise by giving possession no point in making complaint.Kindly clarify only final possession is pending rest all work is completed? Rest work is almost done. But there is a litigation among land owners and case is being filed. The builder have received notice from court in March to stop work. It appears the builder and one of the land developer have not paid money to one of land owner relatives. So inspite of ready building, getting possesion is uncertain.. It is difficult situation. I am not sure that RERA will help you in this case.It is case of clear Title or not in court.There are only two options builder have to pay money to clear Title and Possession or wait till Court case hearing is done. Better is builder pay money to relative and close it.You can try to convince builder if possible. I had bought a flat in virar west in ekta parksville. According to the contract papers they were to give the possesion of the flat by december 2016 but it also had some clause like “it maybe +-6 months, on availablity of occupancy cert., etc”. And they havent given the possesion yet. When ever we ask when will be the possession given they give no answer. Already 10 months have passed and still no sign of possesion. Can i file a complaint in rera? And what will be the chances that thier verdict will be in my favour because am a bit reluctant because of the clause which i mentioned above may favour the builder. So any suggestions? You can file complaint against builder as possession is delayed beyond committed months.If you have proper evidence chance of getting verdict in your favor is high. Kindly file formal complaint in RERA and submit all proofs. Hi Ravi Raj ! we approx 20 staff of a PSU at Mumbai had booked 1800 sq.ft each in 2012 in a soft launch project called Dreamsity on western express Highway beyond Virar. As per the agreement without possession it was supposed to give us in 2015. But so many excuses from developer side ( Ram Agri Infra pvt Ltd) not got possession of the plots till today. In between several times changed their office. In short they are not bothering to give plot or refund. sir, can we complain with RERA in group ? Please guide. If project is registered on the RERA you can complain with RERA.You should have all proof of payment and other details. Hi, my name is ashish mishra. I have an issue with a real estate company from which i have booked plots in 2014, (Prior to RERA). Can i file complain against the company under RERA?? As per RERA every ongoing and under-construction project is supposed come under the regulator’s ambit. As per this logic you can file complain against the company under RERA.